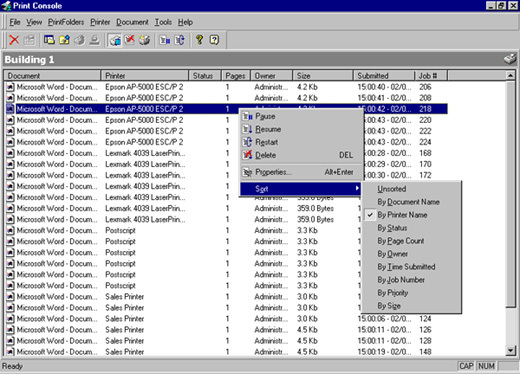 Print Console is a software only print management product. It is licensed per as a single Administrative Client running on Windows Workstation NT, 2000, XP, Vista. The product install changes nothing in the Windows infrastructure and relies only upon the standard Windows print subsystem. The scalability of Print Console has been engineered for any size Workgroup, Network, or Enterprise. If you are a small business with only 2 printers or a business with 100 users, or an entire enterprise with multiple locations and thousands of users and printers, Print Console can be easily installed and administered. Product usability is way in the future, with an easy installation and setup, and complete integration with a Windows Enterprise. With over 10 years of experience in the Print Management arena and by surveying and listening to our customers it has made Print Console a #1 Help Desk utility in the world, which is used in Schools, Universities, Libraries, Corporations, Governments, and Individual consultants. Print Console is licensed per a workstation install. It covers unlimited shared printers on the enterprise. Print Console installs on any Windows Workstation. The product install changes nothing in the Windows infrastructure and relies only upon the standard Windows print subsystem. Print Console has a full setup which installs the product on a workstation. The Print Console Administrator client comprises of files which make up the interface and tools used for administration of the product. Installs on Windows 2000/XP/Vista/Win7 Workstation. Built in licensing for the Client. Product Updates and some Upgrades are done through our electronic update (Eupdate) through the product interface. This will allow an Administrator manually have the option of downloading an update and then automatically installing the update. Remotely Update the Print Console Administrator.